Watch out for these signs that indicate your roof needs to be replaced. Sometimes a roof can naturally reach the end of its useful life without experiencing a roof failure. Even so, if replacing an old roof is delayed, it could result in bigger problems down the road. Watch for the warning signs to be sure to give yourself plenty of time to add the project to your to-do list. Don’t wait until the roof is caving in to discover that it’s time for a new one. Here’s how to tell when a replacement is needed. It’s at least 20 years old. While many shingles today are produced for durability, many factors can accelerate the aging of shingles. 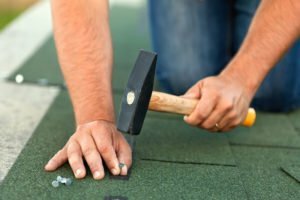 Many roofs come with a 20-year warranty, so if it is nearing the end of that time period, it could be time to renew your roof. It’s leaking or letting in light. Once you step onto your roof and notice a spongy feel, you’ll know that the underlying decking is weakened from moisture. Check your attic to see if there is daylight or water coming through the roof boards. A leak may require some simple repair or renewing the roof, depending on the severity of the issue. There are missing shingles. Check to see if all of your shingle “tabs” are intact. During storms and high winds, many homes lose their fair share of shingles. These slates act as a layer of protection for your home, so you’ll want to replace them as soon as possible. There are dark streaks. Airborne algae cause dark streaks on roof decks. While this may not necessarily harm the roof shingles, it may not look good. You can remove these algae streaks with a blend of 50:50 water and bleach, but it is worth evaluating if these streaks are causing further issues that call for repair or renewal. There are shingle granules in the gutters. Take a look in your gutters. Are they loaded with shingle granules? If you see grains of shingles in your gutters, yard, and landscaping, it’s a sign that the roof is getting old. Roofs lose more granules towards the end of the life cycle. It’s no longer protective. A good roof acts as an insulator against the heat and cold coming into your home. If it’s not doing its job, you’ll notice an increase in utility bills, because your air conditioner or heater is having to work harder to maintain a comfortable temperature. A roof replacement may seem like a daunting task, but remember that your roof is incredibly important to your home’s protection. Once your new and improved roof is up and running, you’ll need to protect it! Contact the team at McCarty Insurance to get started on your tailored home insurance. Call us today to get started.